Sharp is a dominant force in the production of LCD panels so it's used to pushing the boundaries when it comes to LCD TVs. 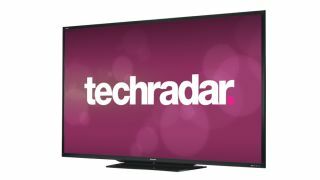 At IFA 2012, it announced the universe's largest LCD TV – all 90-inches and 64kg of it – which measures more than 2m across. It's a direct LED jobby too, which means it probably has in the region of 64 trillion LEDs behind its LCD panel. Unconfirmed reports at IFA 2012 suggest the TV was discovered by NASA's Wide-field Infrared Survey Explorer telescope which has been surveying the deepest corners of the observable universe since it was put into Earth's orbit three years ago. However, Sharp's press release suggests it was in fact built entirely by sane Japanese engineers right here on planet Earth. Don't get too excited just yet though – there's no 8K resolution on offer here. It's not even 4K – it actually incorporates one 1080p panel which does at least suggest that it might be marginally cheaper to buy one than to launch it into space. "Our 90-inch AQUOS LED TV offers size, picture quality and smart functionality unlike anything consumers have experienced with LED TVs to-date," said Alberico Lissoni, the vice president consumer electronics at Sharp Europe. "You can now experience Sharp AQUOS like never before." Sharp says the out of this world TV will go on sale in summer 2013 so that will definitely be enough time for you to save up enough money to buy one. Definitely.